LOS ANGELES - Ethereal, mysterious, spiritual, and mystical, Dead Can Dance created groundbreaking music that captivated fans during their 17-year career. 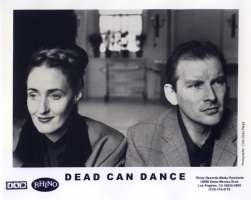 Thanks to 4AD/Rhino Records, the band's best work is now collected in a beautiful boxed set, DEAD CAN DANCE 1981-1998, available November 6 at regular retail outlets and at www rhino.com. This unique and stunningly packaged box consists of three audio CDs and one video DVD, aIl loaded with collectable material, and lists for $59.98. DEAD CAN DANCE 1981-1998 offers the ultimate Dead Can Dance audio and visual experience, collecting 47 songs on three CDs, including key tracks like "The Ubiquitous Mr Lovegrove", "The Carnival is Over", "American Dreaming", "The Host Of The Seraphim", "Cantara", and "Sanvean". Fans will be delighted by the rarities here: a complete and previously unreleased John Peel Session from 1980 ("Labour Of Love," "Ocean," "Orion," "Threshold" and Carnival Of Light,"), "Sloth" and "The Wind That Shook The Barley" (recorded live at KCRW), "Bylar" (Echoes Broadcast), and the very last Dead Can Dance recording, the previously unreleased "The Lotus Eaters." The fourth disc is a DVD containing the feature-length "Toward The Within," previously available on VHS and laser dise only. The film documents a 1994 Dead Can Dance performance at the Mayfair Theatre in Santa Monica, California, and includes interview footage with members Lisa Gerrard and Bendan Perry. The DVD also features promotional (and rarely seen) music videos for "The Carnival 1s Over" "The Host Of The Seraphim," "American Dreaming," "Yulunga (Spirit Dance)," "Frontier" and "The Protagonist." They provide compelling imagery to accompany Dead Can Dance's beautiful melodies and entrancing rhythms. 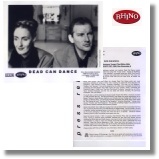 DEAD CAN DANCE 1981-1998 also includes liner notes by Dmitri Erlich incorporating interviews with Lisa Gerrard, Brendan Perry and 4AD founder Ivo Watts-Russell. The box comes in the kind of beautiful, detailed packaging typical of both 4AD and Rhino: A chipboard book reminiscent of old 78 record packaging is secured with rivets and sits in a slipcase. Individual booklets containing track-by-track commentary accompany each disc. Dead Can Dance formed in 1981 in Australia, when Brendan Perry and Lisa Gerrard joined forces, moving to England shortly thereafter. Musically the two drew from diverse sources including the Middle Ages and Middle Eastern chanting and world music-inspiredpercussion and instrumentation to create a unique and eclectic sound that won them a passionate and loyal following. Dead Can Dance disbanded in 1999. Since then Perry bas toured the U.S. and Europe in support of bis solo album, Eye Of The Hunter and Gerrard bas become an A-list film composer, with credits including Gladiator The Insider Heat, and the forthcoming Ali. Please contact Jeff White at Rhino for more information, artwork, or review copies.